Although the tribe Hilarini of the family Empididae is distributed worldwide, the genus Hilara Meigen is mostly Holarctic in distribution. It is the most difficult genus of the family Empididae, as it includes species of a very uniform appearance, lacking distinctive differential morphological features. 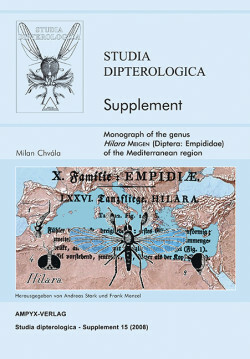 The epigamic behaviour, swarming of both males and females, with mating in variously shaped small or large aerial aggregations, so characteristic of the empididae (the dance flies), reached its peak of perfection in the genus Hilara. The prey, the "wedding present", is usually wrapped up in a silken web produced by the silk glands present on the male fore leg. The mating activity is concentrated around water biotopes, often in very characteristic swarms just above water surface, The species-specific epigamic behaviour leads to an effective ethological and genetical isolation, resulting in speciation of morphologically very similar populations. Some 250 Hilara species have been described in the Palaeartic region until now, of these about 200 species are known only in Europe, the undoubtedly best-investigated region. However, even in Europe many species remain still unrecognised, awaiting decription. The northern European fauna was fully studied in 2005 (Fauna entomologica scandinavica, vol. 40), with 90 wellrecognised species. The present monograph covers the Mediterranean region from the Canary Islands to the eastern shore of the Mediterranean, and it includes altogether 82 Hilara species, in a generally very different fauna to that of cold and temperate Europe. In all, 31 species are described as new to science in the Mediterranean region, classified into 13 natural groups of species charateristic to western Palaearctic fauna.